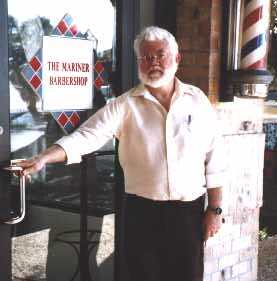 Billy West began barbering in Austin, Texas in the 1960s, with a four-chair shop at 45th Street and Lamar Blvd. During the period between then and now, he has cut thousands of heads...er, I should say thousands of heads of hair. Some of Billy's notable clients include Lyndon Baines Johnson and Darrell Royal. Billy is kin to the football coach in Thorndale, Texas, which has been the State Champion 1A Football team for the Great State of Texas for the 1989, 1994 and 1995 seasons. Billy resided in Cedar Park, about 15 miles north of Austin, and around 1986, Billy got tired of driving the dangerous State Hwy 183 into town every day, and he moved his shop to Cedar Park. Billy has described how, in 1972, you used to be able to drive from Cedar Park into Austin non-stop, and there was just one flashing yellow light. But now, there are probably 50 signal lights and the road is frantically busy because the Cedar Park area got to be really popular, with many subdivisions and strip centers to beautify the landscape. The highway (State Hwy 183) is so busy that it is presently being made into a double-decker highway; they couldn't simply widen it because there are too many strip centers. State Highway 183 got to be so dangerous that somebody sold bumper stickers stating "Pray for me, I drive 183". Cedar Park got too busy, so Billy moved farther north to Liberty Hill, Texas. Billy has for years inspired devotion in his clients, and when he moved his shop, many of his clientele elected to follow him there. Billy has a three-chair shop now, but he reallyonly uses one of the chairs. Billy's family consists of his wife and three sons, who are all interested in computers and the Internet. Billy is happy to be a part of the Lone Star Internet Web site.